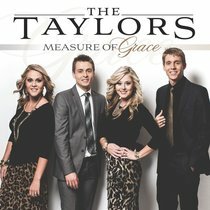 Sibling quartet The Taylors make their national recorded debut, Measure Of Grace, an eleven song collection of soaring southern gospel originals. The recent StowTown signees and 2013 Favorite New Mixed Group winners showcase their stellar harmonies and solid faith on The Greatest Wonder, That Will Be Heaven To Me, The Least I Can Do, and more. :Sibling quartet The Taylors make their national recorded debut, Measure Of Grace, an eleven song collection of soaring southern gospel originals. The recent StowTown signees and 2013 Favorite New Mixed Group winners showcase their stellar harmonies and solid faith on The Greatest Wonder, That Will Be Heaven To Me, The Least I Can Do, and more. The Taylors are a brother-sister quartet from the heart of North Carolina. Jonathan, Suzanne, Christopher, and Leslie are dedicated to stirring up the faith of the Christian community, as well as reaching others with the good news of Jesus Christ through Gospel music. The Taylor siblings grew up as members of Fellowship Baptist Church, a small country church, where their father has been a Southern Baptist minister for over 27 years and their mother the minister of music. With their mother's guidance, it was around the church piano that The Taylors learned their four-part family harmony. Growing up in a Christian home has reinforced their faith and values and has created in each of them a strong desire to proclaim their salvation through the ministry of music. God is at the center of The Taylors' ministry and at the center of their hearts. In 2008, The Taylors won First Place in the Talent Showcase of The National Quartet Convention in Louisville, Kentucky. They are also the 2008 NC State Singing Convention Grand Champions. Recently, they were nominated Top 10 Horizon Group of the Year for 2010, Top 5 Horizon Group of the Year for 2011 and 2012, and Favorite New Mixed Group of the Year for 2013 by Singing News Fans! The Taylors were also nominated as a Top 10 Mixed Quartet for 2012 and 2013 along with some of the nation's best mixed groups, including The Hoppers, The Collingsworth Family, and The Perrys.